No, I don't really think so! With Raphael analyzing and storing assorted mushroom, plant, and weird-organism samples with an eye on possible commercial applications, Marty watched for a minute or two, and Kevin for perhaps twenty – and then they got bored. Kevin was in his private quarters, passing the time with his playthings, while he actually focused on Shayhian, back in Core. When he’d said he was available, and sent an avatar from Kadia to put in an appearance at the hearing chambers (even if most of the other people had been VR), things had gotten underway fairly promptly. The hearings had… gone surprisingly well. The last couple of years of groundwork, putting expanded Thrall-rights into his contract, the fact that it was temporary (and included a survival guarantee), and the ever-improving abilities he offered had made his contract seem a lot more acceptable. The fact that Core already recognized ownership of Neodogs and anthropomorphic animals had meant that everyone was used to the idea. The computer systems, and occasional parents with worrisomely adventurous or troublesome offspring had been allowing them to come to Kadia and sign up anyway – but what had really tipped things for him was the constant presence and assorted helpful activities of hundreds of Thralls; each one a living demonstration that the powers, skills, wealth, and personal enhancements he offered were real, that his Thralls retained their own motives and personalities outside of the “Serve Kevin” compulsion and servant-skills that came with the package, and that – when not “on duty” – they were still pretty much normal kids. Outside of a few protesters and a few attempts to kill the hearing by adding toxic amendments (the one that had came closest to getting through had been disguised as concern over Kevin’s tendency to allow underage breeding; it had attempted to kill things and/or discourage recruits by adding a spay/neuter requirement for Thralls recruited from, or posted to, Core – but it had gone down in flames with only a tiny percentage of support) things had been… quite civil. Soon the ruling would be handed down! There were an unusual number of sea creatures here, darting back and forth along the plants and root chimneys floating in the water around the ship – although that one, rather small looking, shadow didn’t seem to be moving very much down there. It had a… long neck nearly twice the rest of it’s length, four fins off the sides, and a long tail. 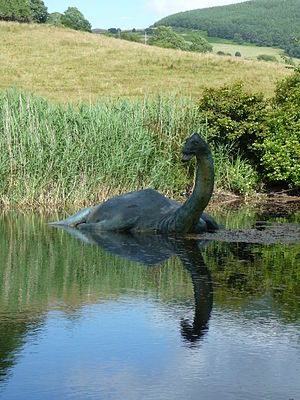 Hey, it was the Loch Ness Monster! And… it was getting larger, and seemed to have oriented itself so that he couldn’t see the head or tail in the shadowy outline. EVERY toonworlder knew that one! It was coming straight at him – or nearly so – and fast! The Thralls out on patrol in dolphin and shark form reported a length of nearly eighty feet and a rapid approach to the surface, with a probable arrival time of about twenty seconds, right in the middle of the fleet between two of the merchant vessels – unless it changed course. Given it’s size, and the fact that it was an active swimmer, it was hard to be more precise than that. Marty started the crew in on protective shielding. Kevin, miffed at being interrupted, simply responded with orders for irritation… The Thralls were reporting that it was apparently a simple animal – non-sapient, not a vehicle in disguise, and not shielded. It just saw a likely food source near it’s favorite hunting ground and was currently deciding which floating tree to eat off of first. In other words, it wanted to smash up the ships a bit and eat whoever fell into the water. Still, if it was an animale it should be easy to drive off. He had the Thralls try to give it the impression of something here making it terribly itchy and some vague recall of pain associated with floating trees. Marty had some throw in some fouling sticky stuff in the water, just in case it proved mentally resistant or something. Thrall-witchery wasn’t all that powerful – but there were a lot of them. The beastie veered off around the far side of the vegetative island for the time being. Well, there was no particular reason to stick around. They’d already gotten their samples, released their insect swarm, and picked up their overboard sailor. Marty was a bit disappointed – he’d have to wait to get the Loch Ness Monster’s autograph – but had to agree. There really wasn’t any reason to stick around. The rest of the trip to Rastsurmer was pretty uneventful; they saw a few more interesting animals and sights – giant sea turtles (perhaps infant sky turtles? ), a huge whirlpool where some crack in the sea floor penetrated deep into the structure of the disk, spires of crystal, and a spot where some magical flux caused an elevated causeway of water to flow for miles through the sky – but nothing else tried to attack them. Back in Cyrweld, an arrogant Otter was rapidly losing his cool… The initial probes hadn’t been encouraging about launching a major attack – and, even at this range, the diviners they’d had monitoring the expedition through the eyes of a few seabirds had been shocked into unconsciousness by whatever the group had done at the Archipelago – and every attempt to probe the area since then had suggested that it no longer existed within Ciarkian! If Angkor actually commanded power on THAT scale, then an attack on him would be a fools game! Even the Eight-and-a-Half-Tails in her prime had never simply… annihilated regions that displeased her! And the money was already in Escrow! Worse, they’d already spent a good deal on the initial probes! If he cost the clan a hundred and fifty thousand Zenni, and had provoked some unlikely wandering godling into breaking their near-monopoly on trade, he would be very lucky indeed if he AND his wife and children didn’t become part of a peace offering to the creature! Still, there were a few personal favors he could call in – and if those individuals got themselves annihilated trying to pay off those favors, well, at least they wouldn’t be complaining afterwards about how unreasonable expecting them to make such an attempt had been! As the light faded, and day turned to the brief twilight of the disk, they saw the mountains of their destination up ahead – and the huge bronze statue of a Rat holding a staff in some heroic pose perched atop the island that marked the entrance to the harbor. A number of lights were set to illuminate the statue and change color on a set rotation – and they could see a number of small little fires illuminating the mountains behind it as well. Well, that was par for the course. War, revolution, or attacking otters? As if on cue, a spectular set of fireworks displays went off behind one of the mountains – and showered a significant area with sparks and light. As the fireworks illuminated the city, they could see rats, otters, and other creatures battling it out with some sort of giant flower. Marty grinned! Now THAT was the kind of festival he could get behind – if it really WAS a festival and not an invasion of anthro-eating flowers. They headed on it – just a bit ahead of the main flotilla, while leaving a rear guard! It might just be a big illusion to cover an otter attack! As they passed the statue and entered the port itself they saw another city that had nestled itself in the mountains on the edges of a natural harbor – although this one had a large rain forest/marsh behind it. The architecture here was significantly more wooden – and was integrated into the docks as it climbed up the sides of the cliffs with winding switchbacks, rope bridges, and an abundance of climbing poles (covered with claw-scratches) everywhere. There were a number of fires burning in the streets and on the roofs, although none of the actual architecture seemed to be particularly burning – despite being on fire. The local residents were (somewhat bemusedly) watching the battles as the city guards and the more adventurous segments of the population chased colorful plant-things through the city and slew them without prejudice. Hm. It didn’t look like a pogrom. The plant-things were setting fires, leaving trails of slime, occasionally emitting masses of sparks, and releasing a pink cloud that the locals were avoiding. Their specific actions seemed to be tied to color of the flower on the head. More importantly, there didn’t seem to be any real consciousness there. Animations perhaps? It could be a holiday honoring some ancient invasion-victory or something. After all, no one seemed particularly worried about it. It WAS a lot like traditional festivals back in Battling Business World! As they arrived in port, they found a dock master coming to meet them. That was bad enough. He was having a hard time restraining himself from saying “have failed to blossom?”. Well, that could be something psychic, could be a dimensional overlay, could be NIMH turning up and introducing some quite alien-to-here elements into the local reality – and they DID seem to have been getting into everywhere recently. Marty had to agree there! They were in the right area for NIMH. Maybe they should grab one of these plant constructs and do some analysis! Well, OK. Go and do something more fun while RAPHAEL did some analysis. Kevin figured that the constructs were probably local enough, but NIMH might well have shown up in the city; it DID seem to have a major rat influence – at least judging by that statue. Hm… There was some level of reality disturbance in the city – although it was always possible that it was just resonance from his own activities, even at this range – but the exact source was difficult to home in on. There WERE traces of the distortion centered on the archipelago, but it was fairly weak now. Ah. There WAS something else adding to the mess though. Some locally, from within the city, and a larger focusout in the forest/marsh. Well, there were an awful lot of people running about in the Manifold! Of course, they’d doubtless get entangled with the flowers and the locals – but then Kevin was an utterly incurable meddler – and it would take the fleet at least a week to unload, sell, buy, and reload cargo – and the Thralls could handle that or call for help if necessary. It certainly didn’t require their attention! Raphael checked the local laws first. If this is a “free city” or some such the group’s usual slave-escorts might be kind of out of place… Hm. A few idiosyncratic local customs, violations of which were punishable by minor fines, but otherwise fairly typical. The local laws did not forbid slavery, although they did require some token of ownership (such as a the usual collar) to signify the lack of free status. There should be no major problems there. They left the Thralls, in various forms, to keep an eye on things and headed out to see what there was to see locally – and to try out some local food and drink! Then perhaps they’d check on the reality disturbance in the swamp if nothing else weird happened! Kevin was also determined to look around for NIMH! As usual, he’d leapt to a conclusion, and would treat it as a strong theory until further notice. He also, of course, sent out some Thralls to check the local slave markets for youngsters with souls and to buy any who were available from particularly desperate or ruthless parents, or because they’d gotten into trouble, or whatever, and to do some recruiting amongst the street kids. Thralls were one of the best investments ever! They could recruit more, and soon you had compound interest! They also spent a little while watching the fireworks from the flower invasion of the fireworks warehouse – although that ran down fairly quickly. Marty got to participate in a bit of the local barroom drinking and brawling – but Kevin got ejected for being “too young” (which he was astounded enough to allow), visited the metals and gems shops (as always, some with interesting local magical potentials and various bits of charmed weapons and jewelry), visited the aroma shops (well, the did smell exciting! ), looked at what wares the carpenters had come up with using the unusual local woods, visited the fabric traders (who were peddling a variety of silks and other fabrics as usual, some with minor magical properties), and watched some of the more dashing types swashbuckle around with the flowers for show, sport, and honor! Kevin bought a lot of trinkets, mostly focusing on gems, silks, fabrics, and clothing. He tended to give away a lot of that stuff! The fireworks caused a good deal of chaos as they shot around the city at random and startled people. Occassionally they struck houses and other buildings and detonated in spectacular explosions – but those generally caused very little damage. They did leave trails of glowing dust that slowly settled to the ground and covered the city in a swirl of glowing color. The light from the fireworks neatly highlighted the guards and adventurerous types battling the flowers through the city. A cat that was leaping from roof to roof as he defeated dozens of flowers with his rapier and acrobatics drew quite a lot of attention – and polite applause! He was drawing quite a bit of female attention as well with his grandiose posing and heroic battling. Kevin briefly considered competing – but animated flowers seemed just a bit… beneath his powers. There wasn’t any challenge there! Meanwhile, the markets were still open despite the evening hours, and one of the more showy salesmen was been busily running a demonstration of a number of new materials that had just come in from the forests earlier that day – much to the amazement of the crowd. New materials in followed by a major assault… Upset someone perhaps? He was currently demonstrating a gem called Flowstone. A sparkling gem of considerable beauty, it was easily malleable with the hands into any given shape. It could be torn apart into two gems with a minor exertion of strength, and two pieces could be pressed together to make a larger one. Exposure to the proper (and only moderately tricky) acoustical tones resulted in the stone hardening significantly – to the strength of iron. The seller was currently demonstrating how he could use a potter’s wheel to make a wide variety of jars, dishes, and glasses using the stuff. Now that was rather neat! – But it implied that he must have quite a lot of it. THAT made Kevin wonder even more at who he took it away from; something that handy and pretty was unlikely to be unclaimed – and he couldn’t have paid much for it if he was making dishes out of it. The other items in the merchant’s current lineup included Dream Mercury, Adamantium, Dusk Wood, White Oil, and Black Gold. Dream Mercury had to be attuned to a specific user and imbedded in a handle. After that, with a bit of practice, the user could mentally adjust the shape of the mercury droplet to any form he wished of the same mass – although a small enchantment tuned to a specific group of forms made it much easier to control. It was very rare and valuable, the two devices he was demonstrating with were a multitool type and a variable weapon. Adamantium was about as usual; It was very hard and very strong and nigh impossible to work once formed. Dusk wood generated an endothermic reaction when it burned, with the peculiar effect of making the air around the wood cooler and absorbing light for a small radius around itself. It was often used – in combination with a few more materials – in everburning enchantments. Purified White Oil made an excellent lubricant, would flow up and over the sides of almost any unsealed container it is kept in, and was a thermal superconductor that always maintained the same temperature across it’s entire volume. t be used for normal enchantments. OK; either the man had cross-manifold connections or he was seriously exploiting some of the locals. That many amazingly-useful “natural” wonders at prices low enough to show them off to crowds in public rather than to carefully-selected plutocrats? That was most unlikely.